München: Wilhelm Goldmann Verlag, 1984. 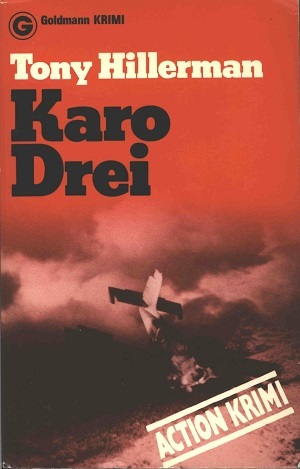 This is the first German edition of The Dark Wind. The fifth book in Hillerman's Navajo Mystery Series, The Dark Wind is the second novel featuring the protagonist Sergeant Jim Chee of the Navajo Tribal Police. This edition is published by Wilhelm Goldmann Verlag in Munich, Germany, Hillerman's text was translated from "American" English into German by Friedrich A. Hofschuster. The title directly translates to "Three of Diamonds", which is a reference to a clue in the novel's plot. The cover design by Design Team München and the cover photo by Richard Canntown, Stuttgart depicts a plane crashing and burning. Binding: Paper covers with red tinted photograph. The author, title, and publisher and publisher's device are printed vertically on the spine in white.